"Shoes are made for much more than walking. 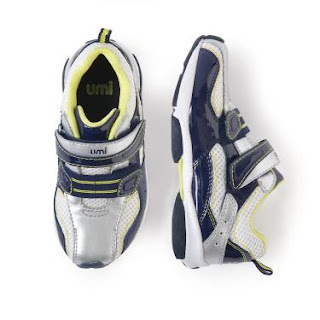 Umi shoes are specially designed for the littlest and hardest working feet in mind. At Umi, our focus is on quality, comfort and style. From years and years of hand crafting shoes for babies, boys and girls we’ve developed a deep understanding of materials, patterns, footbeds—the building blocks of creating the most comfortable shoes around." I am very excited to tell you about the most recent product that I've had the privilege to review: The "Shane" by UMI Shoes. Shane has the sleek styling of a European athletic shoe but is made for any tough-on-their-feet big boy and girl. With light weight construction for making tracks in serious comfort. Removable, machine washable anti-bacterial footbed keeps feet fresh. Play, wash, repeat! Cooper absolutely loves his new shoes. He says they are the fastest shoes that he has ever worn, which is a huge compliment from my 4 year old speed demon! The Shane's are really lightweight, yet extremely sturdy. They have held up to every challenge that my son has put him through, which so far has included a soccer scrimmage and everyday play on the playground at school. I washed these shoes yesterday to see how they would hold up after machine washing. They held up well and came out looking brand new again. I was one pleased Mommy! Anything that makes my job as a Mom a little easier gets an A+ in my book! These shoes are very durable and I know that they will last longer than most of his other shoes tend to. I would highly recommend these shoes, and any of the other adorable UMI shoes to anyone with children. They have met and exceeded both mine and my son's expectations. Be sure to visit www.umishoes.com to find the perfect pair of shoes for your little one. You will receive free shipping and returns on all orders! Also, don't forget to sign up for the Birthday Club to receive a special gift! WIN IT! One Lucky winner will receive a $60 UMI Gift Certificate!! Visit UMI Shoes, then come back and tell me which shoes are your favorite! Tweet about this giveaway! (Leave your Twitter name and a link) You can tweet this daily: “ UMI Shoes giveaway at Opinions of a Moody Mama #giveaway @coopersmommy @umishoes http://tinyurl.com/6mjw9ff "
I really like the racer sandals. hedden look amazing as well! If I am the lucky winner I will totally get the Racer sandals in Leaf Green for my toddler son! I follow you via GFC and Linky (April G). I follow you on G+ as April G.
I like Umi Shoes on Facebook. I follow Umi shoes on twitter as @irishmarmalade. I entered the Technogel giveaway. My favorite are the Heddon. I like the boys Racer shoes. I like the racer sandals. I like the Moraine in purple. You have just voted for Opinions of a Moody Mama! I like the Serenna sandals! Love the Shane shoes in Indigo! Thank you! I like the Isabella sandals. thank you! I'm a facebook fan of Umi! I like the Halina shoes in pink multi the best. I'm a facebook fan of Opinions of a Moody Mama under username Jennie Tilson. I'm a facebook fan of Umi Childrens Shoes under username Jennie Tilson. I love the Jaycee avant-garde metallic, studded thong. Following UMI Shoes on Twitter @hle123.